It may be more than you think! Check out these blogging articles with Blogging Keys to Success, Scouting Romance and more. In the blogs, you will find Keys to Success, Scouting Romance, and more! THE ROMANCE OF SCOUTING: Sounds intriguing, huh? Well, maybe now I’ve got your attention. Really I should say, “Scouting Blogs … more than just Scouting Romance …” Well, if I have got your attention, read on! I have been blogging lately on The Scouting Trail, a Scouting blog site of the Trapper Trails Council. I actually worked as a Scouting professional many years ago in the Lake Bonneville Council, BSA—which today is the Trapper Trails Council. I have blogged about the “fun, adventure and romance of Scouting.” What in the world does that mean, you say? Well, I learned a lot about that subject while at Brigham Young University. One of the professors that my wife and I listened to in about six classes a day was Rulon Skinner. He was a great guy and he sure knew Scouting. He discoursed often about the subject of “fun, adventure and romance” and its application to Scouting. White water rafting … a true Scouting adventure! In the article I touch on Wood Badge and the joy of being an Antelope, singing, “I used to be a Beaver …”, Scouting in Santa Barbara, California, earning the Silver Beaver Award, Camp Bartlett in Idaho, helping pioneer the Varsity Scouting program, mountain men, and a lot more. I even talk about my debut as a weather man! All romantic Scouting subjects …! And while we are on the subject, I invite you to also check out some of the other articles. You might find them interesting. 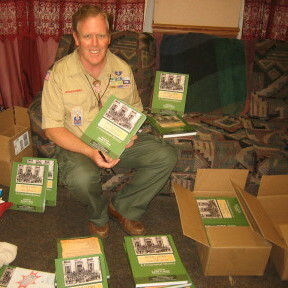 Most of them come from my years of personal journals and are excerpts from my Scouting Trails book, “Mr. Scoutmaster!”. Well, there you have them … several articles about the “Fun, adventure and romance of Scouting”. Check them out! Read what you can or wish to and share this article and the references with your best Scouting friends! And feel free to comment on any or all of them. It is always nice to get feedback and to know that articles are being read. There is more in Scouting than the romance. There is also a lot of fun and adventure! And if these are not enough, here are a few more options for you, as published on The Voice of Scouting blog site that gets published to many Scouting councils in the Western United States. Many of the articles that I have posted on this site have excerpts from my Scouting Trails books, “Gnubie to Eagle Scout” and “Keys to Successful Scouting”. No matter what your Scouting position, or whether you are an adult or youth leader, you might enjoy these or even find them helpful. And “Gnubie to Eagle Scout” is particularly applicable for youth in Scouting. “Gnubie” tells specifically about my own Scouting adventures as a young Scout in the old Theodore Roosevelt Council (now known as the Grand Canyon Council, Boy Scouts of America) in Arizona. And of course, the “10 Keys to Successful Scouting” applies everywhere – youth and adult in the Scouting program. Much of the material presented derives from my 150 or so volumes of my personal journals that I have kept over my lifetime in Scouting. So, you kind of get to experience Scouting firsthand—as it happened—the lessons and the fun, adventure and romance of Scouting. I invite you to check these out and share them with your Scouting friends everywhere. And I would invite you to “like” them or comment on them. I’d love to hear back from you! So, combined, this might be the start of your own Scouting library! Wow! And now you will have plenty to do on rainy afternoons when you need some excitement in your life. But, I hope that you won’t wait until then. Check out the articles and begin to put them to use in your own Scouting operation. Who knows what you might accomplish! And you might want to share all of this with your best Scouting friends and associates. And I’d love it if you would “like” the Facebook page and comment everywhere. Happy reading! The cross posting should be great for building your brand. I think someone else has been training you, because this is way beyond what we have been talking about. Great job!